Even before you bring your newborn home from the hospital, you will be faced with a number of expenses for the requisite baby gear. One effective way of saving money on necessary equipment is to spring for high-quality, gently used items. However, while there are many things that you can safely purchase used, there are others that you shouldn’t take chances with. One of the risky items to purchase secondhand is a car seat, a piece of equipment so essential that it must be in place and properly installed before you’ll even be allowed to take your baby home from the hospital. Before you snap up a car seat at a rummage sale, flea market or consignment store, you should consider the risks involved. You May Not Know the History of the Seat – Unless you’re buying a car seat from someone well known and very trusted, you have no real way of knowing a used seat’s history. Determining the expiration date, quality and reliability of a product designed to save your child’s life is imperative, and it’s just not easy to do when you’re buying a used car seat from someone you don’t know. Previous Crashes Can Affect the Quality of a Car Seat – Even after a light fender bender, parents are encouraged to replace their child’s car seat. Structural integrity can be compromised by even the most minor of accidents, and signs of compromise aren’t always visible to the naked eye. A used car seat may have been in an accident of considerable severity without necessarily showing external signs of damage, but it will not be as effective should you find yourself in an accident of your own. The Potential for Missing or Damaged Components – Kids are notoriously hard on the items they use every day. Even one missing or damaged component on a child safety seat can render it unsafe for use, and keeping up with a variety of components can be a challenge. You may not realize that something is missing from a used seat until you’ve already purchased it, which means that you may not have much recourse for securing a refund from a consignment store for a seat that’s essentially useless. Even worse, you may not notice a missing or damaged component at all until you’ve had an accident and the safety seat doesn’t perform as intended. Determining Expiration – Food expires, medication expires, and so do car seats. Plastics become brittle as they age, especially when they’re exposed to the extreme heat and cold inside a car for a few years. 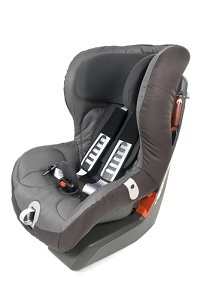 Instead of protecting your child in the event of an accident, an expired seat may shatter or break. Expiration dates are sometimes stamped into the plastic casing, but that date isn’t always legible or can be difficult to find. With the purchase of a new car seat, you know exactly when it will expire. Wear and Tear Damage is Not Always Visible – Babies chew on anything they can find, have accidents in their seats and become car sick. A car seat that’s been dropped from more than three feet at any time in its lifetime may be as damaged as if it were in a previous accident, and all of those signs of wear and tear can be difficult or even impossible to spot. Outdated Seats May Not be Up to Current Safety Standards – Crash tests, safety research and technological advances all play a part in the process designers and manufacturers use to design car seats. Older seats may be outdated or lacking the most up-to-date safety features, in addition to being expired or damaged. Missing Installation and Care Instructions – Anyone who’s ever attempted to install a car seat knows that doing so can be a feat of dexterity and skill. With a new seat, however, you will at least have the advantage of installation instructions in the packaging. Purchase of a used seat will rarely include care and installation instructions, as those have, more than likely, long since been tossed in a recycling bin. Without those instructions, you may not know if a seat is truly installed properly, and won’t be aware of any unique care instructions that may have been originally included in the packaging.